We have just received a shipment of Turtle Beach's new mobile headsets. 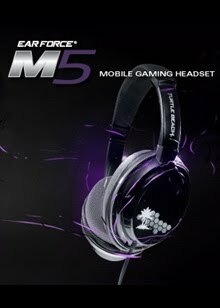 The Turtle Beach Ear Force M3 Mobile Gaming Headset (Silver) - Mobile (In stock usually ships within 24hrs) and Turtle Beach Ear Force M5 Mobile Gaming Headset (Silver) - Mobile (In stock usually ships within 24hrs) are now both in stock in-store and online. hi. these headphones look cool. i had like to know more about it. do keep up posting some more. LAST STORY Wii Pre-Orders Open! Radiant Historia DS Coming Back In Stock!